Synthetic diamond hoop earrings featuring 12 open marquise shapes of round brilliant diamonds. Available options: platinum, 14k or 18k gold: white, yellow, rose. 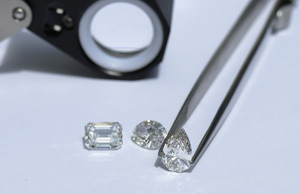 Experience white glove service with Ada Diamonds exclusive Concierge Experience. Each piece of jewelry is custom made to order just for you. Ada Diamonds Design Description- A dazzling pair of hoop earrings featuring weaving open marquise in a huggie style hoop set with lab grown diamonds in 14k white, yellow, or rose gold with a tension back. Starting at pricing for hoops assumes GH, VS lab grown diamonds set in 14kt white, yellow, or rose gold. Additional setting fees for 18kt: $150, platinum $300.